Tyco Electronics decided to give SpaceClaim Engineer to all the engineers who had AutoCAD and Pro/ENGINEER already installed on their computers. A whopping 3500 of them. Although Blake continues to insist that SpaceClaim is a complimentary product to existing CAD applications and not a replacement, I find it hard to believe that SpaceClaim didn’t replace seats of AutoCAD and Pro/ENGINEER at Tyco Electronics. I asked Blake what happened to SpaceClaim Style, the version of SpaceClaim targeted to industrial designers, which now no longer exists. He replied, “People kept buying SpaceClaim Engineer. The volumes of SpaceClaim Style were not high enough to warrant its continued development and testing. We have already taken good care of our SpaceClaim Style customers”. 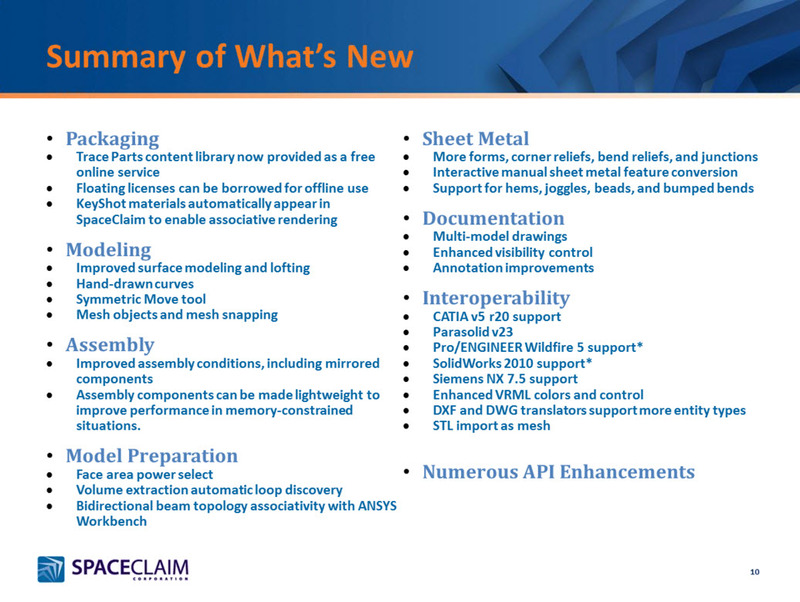 Here is a summary of what’s new in SpaceClaim 2011. SpaceClaim 2011 now has a mesh object for visualization. You can import STL files as meshes but you cannot edit them like solids. To do that you would need our STL import plug-in for SpaceClaim which imports STL files as solid objects. However, you can snap to the vertices of this new mesh object. Take this simple bracket for example. You can section it and sketch curves by snapping to the vertices of the mesh. Then use SpaceClaim’s push-pull modeling to create the solids from the sketches. And finally mirror it to get the other half. 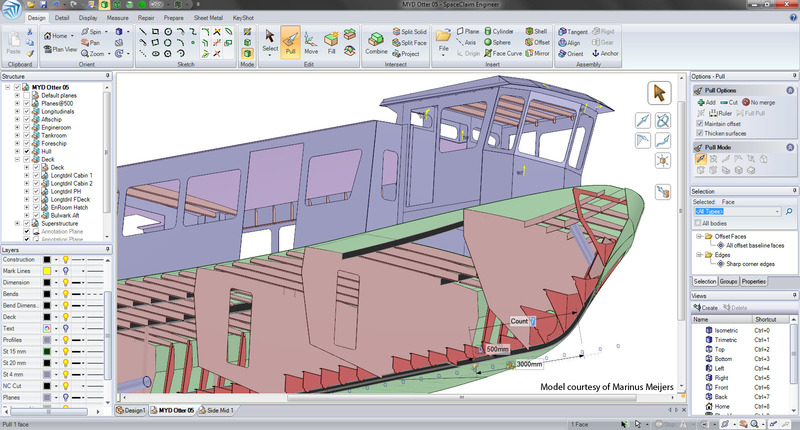 Later you can use SpaceClaim’s direct modeling tools to make modifications to the solid model. I couldn’t help but notice this quote on one of the slides in Blake’s presentation. ← The End Of Solido?